It was first climbed July 9, 1968, by Pat Guilbride, Peter Perfect and K. Pfeiffer. Landing via float plane at Stewart Lake, they bushwhacked into and traversed over Victoria Peak, to reach and climb Warden Peak in what I think was one of the most audacious trips this Island has ever seen. 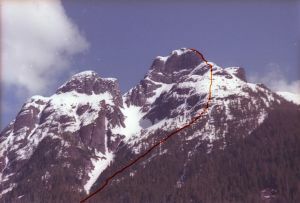 The second ascent was done by Bill Perry and Franz Bislin, August 1972, and was an equal to the first ascent, in that they approached from the eastern, Consort Creek side, up a steep gully to the Vic/Ward Col, climbed Warden, then climbed Victoria Peak from the northeast, which was probably a first ascent from that side and then descended the massif via the White River side, before there were logging roads built into that end of the valley.